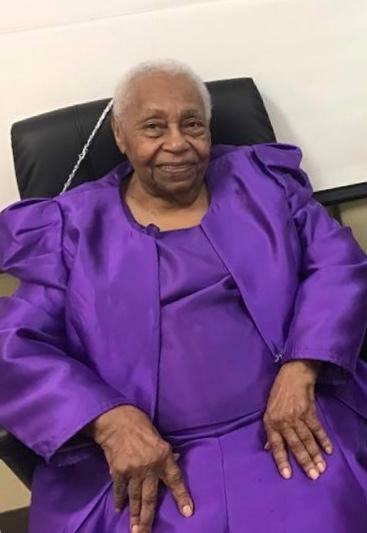 A homegoing celebration for Mother Mary Elizabeth Morris of Tampa, Florida who passed away on Monday, April 8, 2019 will be held on Saturday, April 13th, 2:00 p.m., Triumph Church and Kingdom-God, 2617 E. 24th Avenue, Elder Joseph Gloster, officiating. The interment will be in Lighthouse Memorial Gardens Cemetery in Grand Bay, Alabama. Mary Elizabeth Morris was born on February 8, 1927 to the late Willie and Ruby Braxville Williams in Sanford, Florida. Mary attended Hopper Academy in Seminole County in her early years, but later moved to Tampa, Florida in 1939 and completed her education graduating from Middleton Senior High School in June 1945. She was a resident of Fort Lauderdale, Florida for many years before returning to Tampa, Florida in 1990. Her life long career was in upholstery and as a seamstress. She was always very passionate about her work and took great pride in her finished products. Mother Mary was a born again Christian joining the body of Christ at an early age and was a faithful and devoted member of Triumph the Church and Kingdom of God in Christ where she served as a shepherd mother. Her passion was her church, where she served faithfully until her health began to fail. She was preceded in death by her parents; children, Faye Burgess, Paulette Patterson, Ronald and Willie James Morris; siblings, Willie Williams, Jr., Joseph Williams, Sr., Ruby Lee Williams and Maybelle Jones; granddaughter, Mary Morris; nephews, Elder Joseph Jefferson, Jr. and Eddie Thompson, Jr. She leaves to cherish her precious memories with her son, Bernard Morris, Jr.; her loving and devoted grandchildren, Belinda Morris, Betty Patterson, James Patterson (Maria), Rhonda Morris Jenkins (Kenny), Roderick Morris (Charmaine), Cheisa Morris, Willie Morris (Roseanne), Keith Morris, Ebony Morris, Aaron Morris, Aaron Morris, Yolanda Morris, Patrena Barr and Jana and James Barbary; special great grands, Anthony Williams (Amber), Drew and Morgan Dixon, Kendra, Dominique and Kenny, Jr. and a host of other loving great grandchildren; only devoted sister, Martha Thompson “Bunch”; nieces, Constance Cummings (Jerome), Phyllis Lawrence (Jesse), Sharon Thompson, Tonyata Thompson, Kaya Lawrence, Kennedy Green, Sabrina Williams, Darlene Williams, Nazarene Williams, Janeen Lynn, Yvonne Aikens and family, Barbara Gay and family and Cynthia McRae and family; nephews, Joseph Williams, Jr. , Raymond Williams (Lucille), Reginald Thompson, Anthony Williams, Douglas Williams and Greg Williams, Jerome Cummings, Jr., Raymond Williams, Jr., and Demond Williams; cousins, Aldrena Artis; other relatives and special friends; son-in-law, Danny K. Patterson; god-daughters, Frances Knight and Patricia Wimberly; niece-in-law, Denise Jefferson; special friends, Betty Williams, Triumph the Church and Kingdom of God in Christ church family; a host of nieces, nephews and other sorrowing relatives and friends. The visitation will be held at Aikens Funeral Home on Friday, April 12th from 5:00 to 7:00 p.m. The family will receive friends from 6:00 to 7:00 p.m. The family and friends are asked to meet at the church on Saturday for the service.